Intro from Barrett Golding: This article begins a series of talks with people who build Story-Making Machines. We pose a series of questions. They send answers and examples of their tools in use. Up first is Meograph ("Four-dimensional storytelling") Founder and CEO, Misha Leybovich. “Meograph is the easiest way to create multimedia stories. With no training you can quickly create stories about the news, history, travels, life events, and more by combining video, audio, pictures, text, links, maps, and timelines. Then share by embedding anywhere on the web, or through your favorite social network. Transom: What makes your application different from other storytelling solutions? 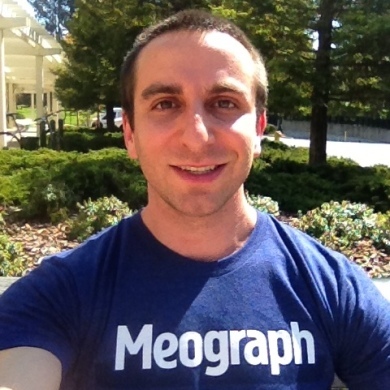 Misha Leybovich (Meograph CEO): Meograph is super simple to use, brings in all types of multimedia, provides context in a way that others don’t, and is updatable anytime. Transom: What elements can be included in your presentations (with what qualifications)? Transom: Any new features coming this year? ML: Loads! We’ve added a search interface. Keep an eye out for much more flexibility in what the product can do, rolling out to half a dozen more verticals, and more integration with other services. Transom: Any good stories about building your storytelling tool: obstacles/hard-choices/revelations? ML: This whole thing has been an adventure. We’ve been lucky to put out a product that people seem to like and be willing to share feedback on, and to have a team that can act to iterate quickly. First big screwup was the initial version of the authoring tool for the first month after release: way too abstract to be usable … though at the time I was convinced it was going to win design awards for its revolutionary UI. Transom: What have you learned about how humans tell stories? About how we view, read, and hear them? ML: The creativity people have is awesome, and they will always find new and cool ways to use creative tools. We have picked up some best practices on digital storytelling (how to pick the most salient points and put context around them) and on authoring (simple, prescriptive in how-to, but flexible). Meograph in Nonprofits — A nonprofit tells their story with rich media. ML: Our player is an embeddable HTML object, and Meographs are stored as JSON files. Should the unthinkable happen, we would have no problem letting our users download their content. But that whole downer scenario is looking pretty unlikely :). Transom: On what technologies does your product, and its embeds, depend? ML: Ruby on Rails, CoffeeScript, Haml, Sass. Transom: Have you been able to incorporate the guidelines of the Web Accessibility Initiative and Accessible Rich Internet Applications (WAI-ARIA)? ML: Folks of all ages and abilities have been able to use our site without a problem. Transom: How is story/journalism/multimedia a part of your life? ML: My cofounder Francis and I have always been storytellers … he in film and multimedia, me in person. Together we have a passion for making it easy for anyone to tell their stories. Transom: Any thoughts on the evolution of storytelling, and the effect the Internet and digital-media has had? ML: We’re just at the beginning of what rich media and the Internet will enable in terms of rich storytelling that anyone can do. With Meograph, we are hoping to lead the way! View Transom’s Meograph-ic consdensation of our year Twenty Twelve. Misha Leybovich is Founder and CEO of Meograph.